Summary The first solar community centre built by the Plusenergie® construction method. 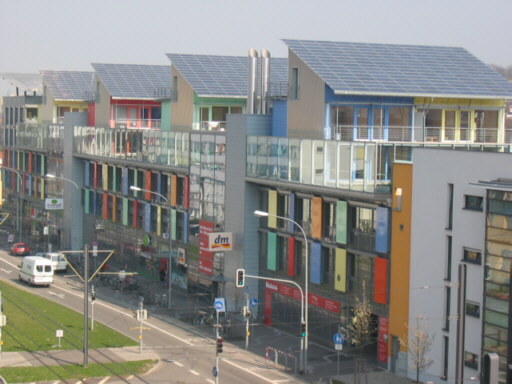 The "Sonnenschiff" runs along Merzhauser Straße for a stretch of 125 m (136.7 yards) and is the entrance front of the Schlierberg Solar Estate in Freiburg. The buiding is designed for energy efficiency. Computer simulations show that a heating energy demand of yearly 10 to 20 kWh per m2 effective area is to be expected – depending on the usage, the position and the proportion of the units´ exterior surfaces. On balance, the Sonnenschiff will gain its power demand entirely from renewable energy. On the pitched roofs of the penthouses and the head construction to the north, about 1 000 m2 (1 195.9 square yards) of PV modules with 135 kWp are installed. The electric power fed into the public power supply system.